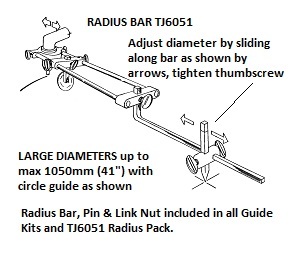 The separate pack (TJ6051) comprises a straight pin, brass link nut, fasteners and 350mm (14”) bar. A maximum circle of 1050mm (41”) diameter is achievable when used with a Tanjant circle guide. A Magnetic Pivot (TJ6086) or Suction Pivot (TJ6505 – plasma cutting only) offers even greater security to the cutting process. Tanjant’s Radius Bars may be joined using the Link Nut to create longer lengths for large diameter circle cutting.